Lee has an M.A. from New York University and worked as a Registrar at Columbia University before moving to Boston. She made Worcester home in 1997 after graduating from the New England School of Law and joined the Worcester Area League of Women Voters in 1998. She has since added public relations, social media development, voter services chair, v.p., and president to her Local League portfolio, serving as the local league president from 2002-05 and 2010-15. Through the years, a changing League demographic meant a commitment to experimenting with new local league structures, collaborations with other non-profit organizations, outreach to college students, and exploring the regionalization of programs and projects with other County Leagues. 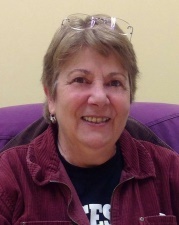 Lee was the initiator of LWV management of Naturalization Services in Worcester, has spun off League presence at the ceremonies in other counties, and hopes to imprint the LWV brand on every Naturalization ceremony conducted in the Commonwealth. She has been a member of the State Nominating Committee for three years and served as this year’s chair. Thinking ‘outside the box’ and an emphasis on advocacy will be Lee’s focus in making the local and state Leagues visible, viable and relevent as we aim toward attracting membership and celebrating our 100th birthday in 2020.